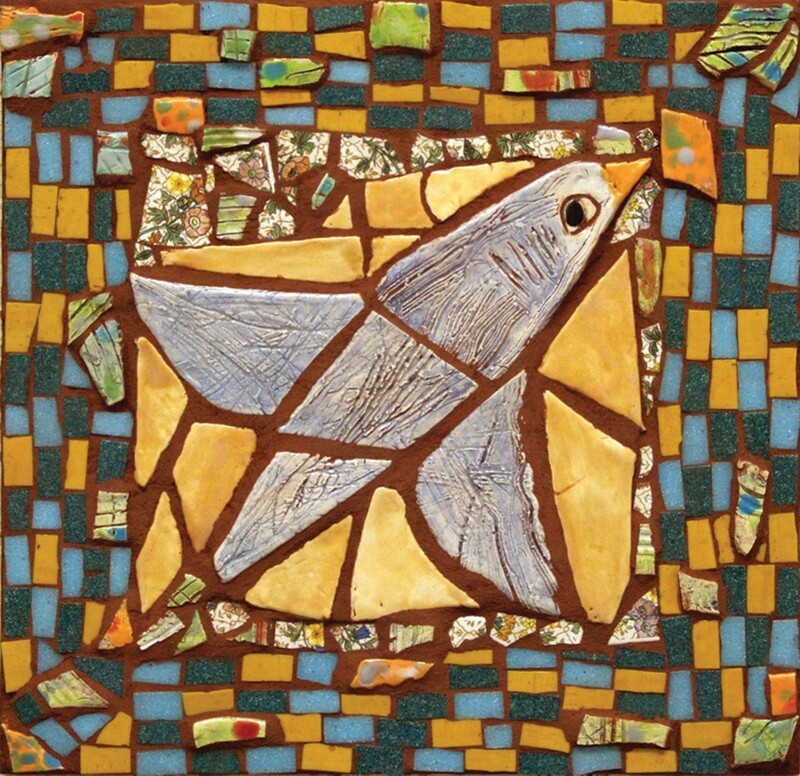 March 05, 2015 Art Walks + Festivals » Arts Alive! Saturday, March 7, 6-9 p.m.
Shawn Griggs' paintings at the Morris Graves Museum of Art speak to his "infatuation" with the North Coast's beauty. 1. EUREKA INN 518 Seventh St. Dance showcase in lobby, live music in Palm Lounge. 2. HUMBOLDT ARTS COUNCIL at the Morris Graves Museum of Art 636 F St. Performance Rotunda: Music by Good Company. William Thonson Gallery: "Inner Worlds, Outer Worlds, and Points in Between," Shawn Griggs. Knight Gallery: "Finding Your Place", Katherine Meyer. Anderson Gallery: "Notations on the Great Highway," Natalie Craig. Youth Gallery: Zane Middle School, 6th-8th grade students. Homer Balabanis Gallery & Humboldt Artist Gallery: Humboldt County artists, watercolors, and Steve Porter, live watercolor paintings. 3. EUREKA THEATER 612 F St. Celebrating its 76th anniversary with Gone With the Wind at 5:30 p.m. 35 cents adults, 10 cents for kids 12 and under. 4. 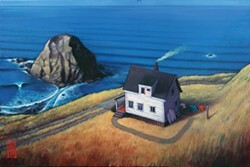 REDWOOD ART ASSOCIATION 603 F St. "Elements: Earth, Wind, Fire." 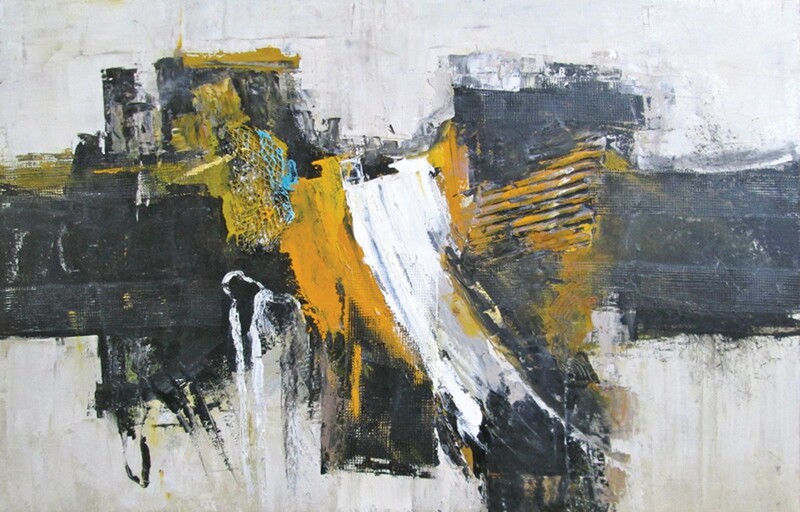 Upstairs gallery 1: Pat Kanzler, oils, acrylics and pen and ink. 6. EBERT CAPITAL MANAGEMENT, INC. 530 F St. Ned Simmons, artwork. Live music tbd. 6a. DALIANES WORLD TRAVEL SERVICES 522 F St. "Support our Girls," fundraiser for Humboldt Breast and GYN Health Project. 7. F ST. FOTO GALLERY at Swanlund's Camera 527 F St. "Impressions & Perceptions," Arcata Arts Institute photography students. 7a. THE LOCAL 517 F St. "Trifecta," Joseph Sandoval, photography. 7b. REDWOOD MUSIC MART 511 F St. Music by Ryan Bridwell. 8a. EUREKA STUDIO ARTS 526 Fifth St. Andrew Daniel, figure painting demonstration, Kathy O'Leary, plein air paintings. 9. THE EMPIRE 712 Fifth St. "Living Fern Sculptures," Cody Wandel, botanical exposition. 11. BOLLYWOOD INDIAN CUISINE 535 Fifth St. Belly dancers and music. 11a. ROSE'S BILLIARDS 535 Fifth St. Raffles and drawings. Music by Mark Hayes. 12. HUMBOLDT REPUBLIC 535 Fourth St. Classic Humboldt Republic artwork on canvas. 13. SEWELL GALLERY FINE ART 423 F St. "Out of Bounds," Georgia Long, new mixed media, Gary Bloomfield, wildlife illustrations. Music by Lisa Baney. Beverage service benefits Redwood Coast Music Festivals. 13a. NORTH COAST DANCE 426 F St. Vignettes from Cinderella, Swan Lake and a performance of the Can Can. 13b. BLACK LIGHTNING MOTORCYCLE CAFÉ 404 F St. Artist and live music tba. 14a. SIDEWALK GALLERY at Ellis Art and Engineering, 401 Fifth St. "Meta-physical show," Shannon Korb. 15. AMIGAS BURRITOS 317 Fifth St. Katherine Ziemer and Vince Cavataio, photography. 16. PRIMATE TATU 139 Fifth St. "Old School Art," Michael Arneson. 17. KINETIC MUSEUM 110 Third St. Screening historic race footage. Music by Sultan of Smudge. In the Champagne Alley, behind 110 Third St.
18. CHERI BLACKERBY GALLERY and THE STUDIO 272 C St. "Wings Over Water," Ardi Areson, Chris Johnson, Elizabeth Kordes and Bill Rubenack. 18a. C STREET STUDIOS & HALL GALLERY 208 C St. Studio artists show. 18c. SAILOR'S GRAVE TATTOO 138 Second St. Tattoo related art, antiques and memorabilia. 19. SWEET SEA STUDIO, 129 Second St. Digital photography. 19a. GALLAGHER'S IRISH PUB 139 Second St. Ron Thompson, oil paintings. 20. BAR FLY PUB AND GRUB 91 Commercial St. Kathleen Bryson's private collection. Music by DJ Pressure Anya Productions. 21. STEVE AND DAVE'S First and C Streets. Marni Schneider, photography. 21a. REDWOOD CURTAIN THEATRE 220 First St. Augustus Clark, acylic paintings. Please note: shortened Arts Alive hours due to The Velocity of Autumn at 8 p.m.
22. CHAPALA CAFE 201 Second St. Kylan Luken, photography. 22a. C.L. LEATHERS 215 Second St. Music by Joe Garceau, serving Royal Bavarian Brazen pretzels. 22b. GOOD RELATIONS 223 Second St. Rachel Robinson, oil paintings, and Va Va Voom window performance. 23. HUMBOLDT HERBALS 300 Second St. "Paintings by Jeff Stanley," acrylic and open acrylic on canvas and wood. Music by Jon Parmentier. 24. THE SIREN'S SONG TAVERN at ROMANO GABRIEL SCULPTURE GARDEN 325 Second St., Suite 102 "Silent Cinema," Willy Wonka and the Chocolate Factory with live DJs. $10 for headphones to watch the outdoor movie with sound beginning at 8 p.m.
24a. BRENDA TUXFORD GALLERY 325 Second St. "Inspiring Girls," women and girls of North Star Quest Camp. 24b. HERE & THERE 339 Second St. Andrew Daniel, acrylics. 25a. CLARKE HISTORICAL MUSEUM 240 E St. "A Scottish Syndicate in the Redwoods," Marvin Shepherd, book signing. 25b. CALIFORNIA MENTOR 317 Third St. Reuben Mayes, Iris Smith, Jerry Spaulding. 25c. HUMBOLDT MEDIATION SERVICES 317 Third St., Suite 8. Brandy Mayers, photography, "Places and Faces of Love and Peace," Beverly Prosser, quilt. 27. CAFÉ NOONER 409 Opera Alley Doug Freie, paintings. Music by John Myers and Jim Silva. 28. RAMONE'S 209 E St. Art by Jim. Music by Topaz. 29. BOOKLEGGER 402 Second St. "Tonglen for Our Own Suffering," Swami Girijananda, book signing. 30. TRUCHAS GALLERY/LOS BAGELS 403 Second St. Jesse Pearson, mixed media. 31. NORTHCOAST KNITTERY 407 Second St. Great Adirondack Yarns. 32a. OLD TOWN ART GALLERY 417 Second St. Howard Rutherford, featured artist. 33. CORNUCOPIA 425 Snug Alley. Music by Rabbi Les Scharnberg. 33b. NEW AMERICAN FUND 108 F St. Eve Miller, glass installation works. 34. HSU FIRST STREET GALLERY 422 First St. "Chicanitas: Small Paintings from the Cheech Marin Collection," and "The Royal Chicano Air Force: Arte Para la Raza," Curated by Phil Hitchcock. 35. BAYFRONT RESTAURANT 1 F St. Plaza. Richard Duning, paintings. 36. LIVING THE DREAM ICE CREAM 1 F St. Arny King, photography. 37. STRICTLY FOR THE BIRDS 123 F St. "The art of nature," Louise Bacon-Ogden, paintings. 37a. LINEN CLOSET 127 F St. Patti Lohr, jewelry. 38. EUREKA FABRICS 414 Second St. Pat Durbin, quilt art. 39b. GEMINI VINTIQUES 420 Second St. Dee Quier and Janeen Lindstrom, upcycle artists. Music by Howdy Emerson. 40a. COCO CUVEE Inside Riverbend Cellars 434 Second St. Rob Hampson, abstracts. 41. ALIROSE 229 F St. Susan Strope, paintings. 41a. THE WINE SPOT 234 F St. Frank Speck, acrylic classic cars on canvas. 42. OLD TOWN JEWELERS 311 F St. "Pet Portraits," Leslie Allen. 43. AMERICAN INDIAN ART GALLERY 233 F St. Dawn Woodman. 44. HUMBOLDT BAY COFFEE 526 Opera Alley. Angela Armijo, paintings. Music by Kenny Ray and the Mighty Rovers. 46. FUNK SHUI 213 F St. Rosalie (Savage) Thomson, portraits and oil paintings. 46a. OLD TOWN COFFEE and CHOCOLATES 211 F St. Music by Jenny & David & The Sweet Soul Band. Music by Funk Blues & Soul Band. 47. OLD TOWN ANTIQUE LIGHTING Second and F streets. Nine local artists, oil and watercolor paintings. 48. IF: Inspired Interiors 514 Second St. Music by one of Judy Phillips' harpist students, at 7:30 p.m.
50. WOLF DAWG 525 Second St. Natalya Burke, landscape paintings. 51. ORIGIN DESIGN LAB 621 Third St. "Upcycle 2015," by young makers who are learning to design and create their own wearable items. 53. ORANGE CUP CORAL SALON 612 Second St. Rob Hampson, oils. Music by Fickle Hill. 54. CIA (Center for Insane Artist) GALLERY 618 Second St.(above the Art Center Frame Shop) "Insane Art Show," David Orchard and Janarie Fisher Ricchio, Marnie Cooper, Jeremy Farrell, Jose Nunez and Blake Reagan. 54a. PIANTE 620 Second St. Lauris Phillips, sumi painting and watercolors, Willa Briggs, mixed medium monoprints, Joan Katri, paintings. 55a. LOTUS STUDIO 630 Second St. Various Humboldt artists, paintings and ceramics.